Human erythrocytes are produced through a process called erythropoiesis. They take about seven days to mature. After about 100-120 days, RBCs are removed from circulation through a process called eryptosis. Erythropoiesis is the process by which human erythrocytes are produced. It is triggered by erythropoietin, a kidney hormone produced during hypoxia. Erythropoiesis takes place in the bone marrow, where hemopoietic stem cells differentiate and eventually shed their nuclei to become reticulocytes. Iron, vitamin B12, and folic acid are required for hemoglobin synthesis and normal RBC maturation. Reticulocytes mature into normal, functional RBCs after 24 hours in the bloodstream. Following eryptosis, the liver breaks down old hemoglobin into biliverdin and iron. The iron is taken back to the bone marrow for reuse by transferrins, while biliverdin is broken down into bilirubin and excreted through digestive system bile. erythropoietin: A hormone produced by the kidneys in response to hypoxia, which stimulates erythropoiesis. bilirubin: A bile pigment that arises when biliverdin is separated from the iron of old hemoglobin molecules in the liver. Bilirubin becomes part of bile salts in the digestive system and is excreted, while the iron content is reused. Human erythrocytes are produced through a process called erythropoiesis, developing from committed stem cells to mature erythrocytes in about seven days. When matured, these cells circulate in the blood for about 100 to 120 days, performing their normal function of molecule transport. At the end of their lifespan, they degrade and are removed from circulation. 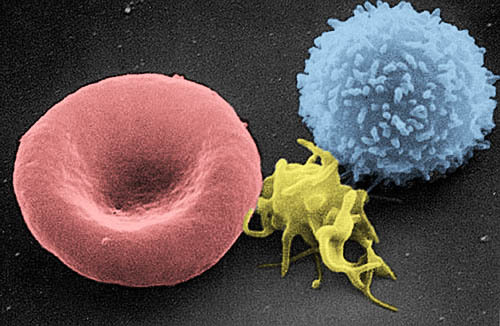 Scanning electron micrograph of blood cells: Shown on the left, the erythrocyte, or red blood cell, has a round, donut-like shape. Erythropoiesis is the process in which new erythrocytes are produced, which takes about seven days. Erythrocytes are continuously produced in the red bone marrow of large bones at a rate of about 2 million cells per second in a healthy adult. Erythrocytes differentiate from erythrotropietic bone marrow cells, a type of hemopoietic stem cell found in bone marrow. Unlike mature RBCs, bone marrow cells contain a nucleus. In the embryo, the liver is the main site of red blood cell production and bears similar types of stem cells at this stage of development. Erythropoiesis can be stimulated by the hormone erythropoietin, which is synthesized by the kidney in response to hypoxia (systemic oxygen deficiency). In the last stages of development, the immature RBCs absorb iron, Vitamin B12, and folic acid. These dietary nutrients that are necessary for proper synthesis of hemoglobin (iron) and normal RBC development (B12 and folic acid). Deficiency of any of these nutrients may cause anemia, a condition in which there aren’t enough fully functional RBCs carrying oxygen in the bloodstream. Just before and after leaving the bone marrow, the developing cells are known as reticulocytes. These immature RBCs that have shed their nuclei following initial differentiation. After 24 hours in the bloodstream, reticulocytes mature into functional RBCs. Eryptosis, a form of apoptosis (programmed cell death), is the aging and death of mature RBCs. As an RBC ages, it undergoes changes in its plasma membrane that make it susceptible to selective recognition by macrophages and subsequent phagocytosis in the reticuloendothelial system (spleen, liver, and bone marrow). This process removes old and defective cells and continually purges the blood. Eryptosis normally occurs at the same rate as erythropoiesis, keeping the total circulating red blood cell count in a state of equilibrium. Many diseases that involve damage to RBCs (hemolytic anemias, sepsis, malaria, pernicious or nutritional anemias) or normal cellular processes that cause cellular damage (oxidative stress) may increase the rate of eryptosis. Conversely, erythropotein and nitric oxide (a vasodilator) will inhibit eryptosis. Following eryptosis, the hemoglobin content within the RBC is broken down and recirculated throughout the body. The heme components of hemoglobin are broken down into iron ions and a green bile pigment called biliverdin. The biliverdin is reduced to the yellow bile pigment bilirubin, which is released into the plasma and recirculated to the liver, then bound to albumin and stored in the gallbladder. The bilirubin is excreted through the digestive system in the form of bile, while some of the iron is released into the plasma to be recirculated back into the bone marrow by a carrier protein called transferrin. This iron is then reused for erythropoiesis, but additional dietary iron is needed to support healthy RBC life cycles.